We are a family run business based in Kent. We supply and fit the highest quality splashbacks throughout Kent and London in a huge range of colours and bespoke designs. Our customers always receive personal service from start to finish. Glass splashbacks are essentially a sheet of toughened glass which is cut to the exact size and shape of your wall space. The back of the glass is then coated with a special paint, or printed with a design or image. The image or paint colour is visible from the front of the glass but can't be scratched, stained or damaged. Toughened glass splashbacks are strong and last a very long time. We use 6mm Low-iron Toughened Glass because it is the clearest glass available. Colours will be much more pure, and images have more clarity with this type of glass. Customers can choose clear toughened glass if they would prefer a green tinge to their colour. White appears as mint white. Usually, only white and black are offered in clear toughened glass because of this. 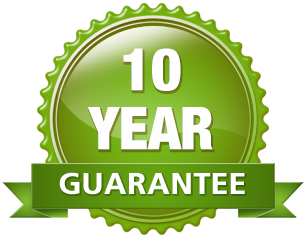 All of our resin based paints come with a 10 year guarantee, so your splashbacks will still look like new many years from now. All of our glass, where possible, is toughened glass to BS EN12150 and can withstand heat of up to 400°c, which is ideal for behind a cooker. 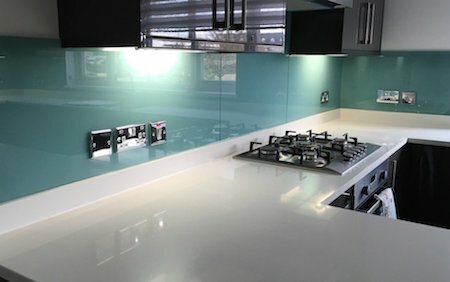 Why should I install glass splashbacks? You can choose from over 18,000 colours! (crown, deluxe, pantone, RAL etc). This means that your splashbacks will match your decor perfectly. Photographs and textures can be printed on your splashbacks and our team of designers can help create your bespoke design. Glass is one of the most hygienic surfaces there is. This makes glass perfect for kitchens and bathrooms because it does not absorb liquids or bacteria. Household chemicals will not damage the finish of your glass splashbacks, which means you can clean them time and time again. Wine, vinegar or bleach will not cause stains, which makes glass much more hard-wearing than laminate, metal or wood. Kitchen Glass Splashbacks. Hard wearing and easy to clean. Find out more about our glass splashbacks for kitchens. Bathroom Glass Wall Panels. Glass panels are a great replacement for wall tiles, resulting in no more discoloured grout or leaks through the gaps in the tiles. Frameless Glass Shower Screens. A new shower can transform your bathroom or wet room. Our installers will help you make the most of your shower. Glass Balustrades for stairs, balconies and decking. Glass balustrades create space and light, and instantly give your property a wow factor! We will arrange a time to come and visit you for a relaxed chat with no obligation or hard sell. This is often the best way because we can show you samples and you can see our very latest work on the iPad. This way you will also receive a quote on the same day - even on the spot! You can email dimensions to us for a free quote. It is best to include a sketch or photograph to show us where any cut-outs will be. Our team will then send your quote by email. Each client receives 2 free samples on request.